I LOVE pesto and I make this exact recipe every time! Why mess with a good thing right?! My daughter gobbles this up too, so I make a lot to always have some on standby. Make your choice of pasta to go with it. We have an amazing zucchini pasta recipe on the site that would be perfect! Try it out! Combine sunflower seeds, garlic, basil, salt, pepper, and ¼ cup extra virgin olive oil, and blend. Gradually add the remaining ¼ cup while blending. Empty into a bowl and scrape sides of blender to get it all out. Stir in the parmesan cheese. Mix your cooked pasta with the pesto and enjoy this gluten free vegetarian dish! Yum. I like making pesto with different herbs and really like to make it with Thai basil, spinich leaves, kale, curly or flat parsley and sometimes swiss chard. I use pine nuts if making the traditional way but have made pesto with cashews, pistachios and walnuts. Sometimes I also throw in some infused EVOO that I have made. 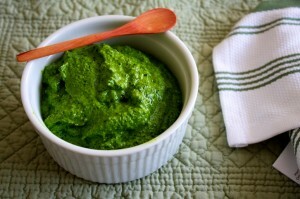 Try roasted pumpkin seeds, known as pepitas…they make an excellent pesto with the spinach leaves. How clever to use sunflower seeds, Jamie! I use almonds, rather than traditional pine nuts) in mine. I’ll have to try the sunflower seeds next batch. Bet they give it a nice flavor twist!